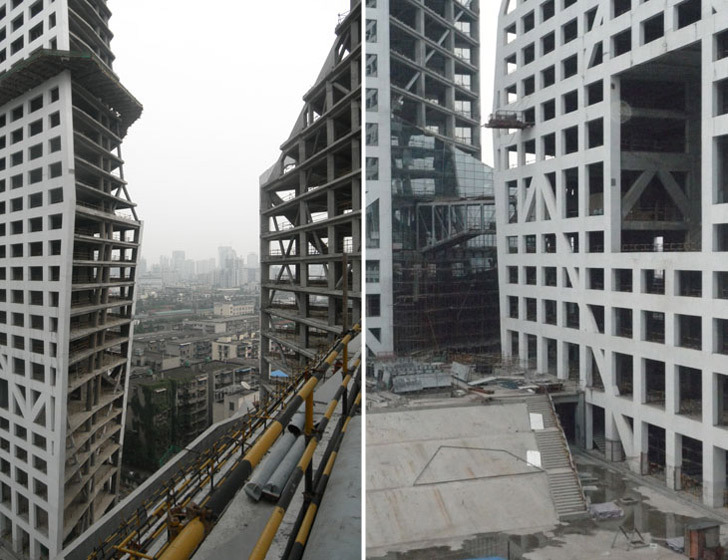 Steven Holl Architects’ gigantic Sliced Porosity Block just topped out in Chengdu, China, inserting its striking neo-canyon profile into the urban grid. The large-scale, LEED Gold project is a pedestrian friendly gathering space which, while immense in size, attempts to reduce its bulk with large openings to provide code-mandated natural light to the surrounding neighborhood. Five openings provide visitors access to the public plaza and a poetic and inspired space, complete with ponds and fauna, mimic a small valley surrounded by steep cliffs. The project is slated to achieve LEED Gold. The design includes, amongst many other things, a sizable ground source heat pump consisting of 480 wells to provide heating and cooling for the complex. Sliced Porosity Block is part of a string of large-scale buildings Holl has designed in China, and is an exemplification of his process of creating space that has a narrative of nature, while providing for a pedestrian friendly environment. The challenge for the project was to scale up while maintaining a public space that did not become overwhelmed by the mass of the development. The fissure like façade, linked by sky bridges and strata like angled elements, reduces the bulk and provides unexpected views as well as a channel for light to enter the interior courtyard. Famed Chinese poet Du Fu, who spent time in the city in the 8th century, was the touchstone for the inner courtyard’s design. Holl describes the poet’s line,”Time has left stranded in Three Valleys” as the inspiration for the ponds. Filled with reclaimed rainwater and plants, the three ponds also serve as the skylight for the shopping mall below. They also provide a cooling microclimate for vistors, and together with the three surrounding pavilions they become the heart of the complex. The stairs leading to the plaza are lined in stone and undulate in an expressive fashion, reflecting the non-linear thinking behind Holl’s design approach. The project is slated to achieve LEED Gold. The building features, amongst many other things, a sizable ground source heat pump consisting of 480 wells to provide heating and cooling for the complex. 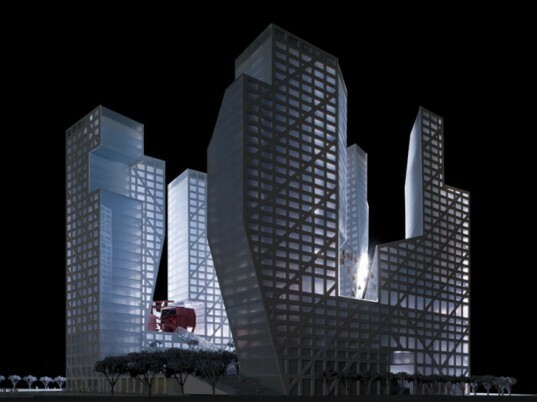 Sliced Porosity Block is part of a string of large-scale buildings Holl has designed in China. The design exemplifies his process of creating space that has a narrative of nature while providing for pedestrian friendly use. The challenge for the project was to scale up while maintaining a public space that did not become overwhelmed by the mass of the development. The fissure like façade, linked by sky bridges and strata-like angled elements, reduces the bulk and provides unexpected views while channeling light to the interior courtyard. Famed Chinese poet Du Fu, who spent time in the city in the 8th century, was the touchstone for the inner courtyard’s design. Holl describes the line "Time has left stranded in Three Valleys” as the inspiration for the ponds. Filled with reclaimed rainwater and plants, the three ponds also serve as the skylight for the shopping mall below. They also provide a cooling microclimate for vistors, and together with the three surrounding pavilions, becomes the heart of the complex. The stairs leading to the plaza are lined in stone and undulate in an expressive fashion, reflecting the non-linear thinking behind the design approach.